ANIMA MORTE may not be a name that you recognise right now but they are a band that you should look out for if you enjoy instrumental cinematic music with a touch of horror. Having already released three full albums: 2007's Face The Sea Of Darkness, 2011's The Nighmare Becomes Reality, and their latest in 2014 Upon Darkened Stains they obviously have the talent to go far. Let us not forget they have also released two 7" EPs, the split 12" EP with Polish ANTIGAMA, plus they have contributed to various compilations. 'Inertia Of The Risen' is the Swedish quarttet's latest 7" EP and as you can tell they collaborated with the one and only Italian film composer Fabio Frizzi, who is well known in the horror community for his work on many of Lucio Fulci's films including ZOMBI 2, CITY OF THE LIVING DEAD and THE BEYOND. 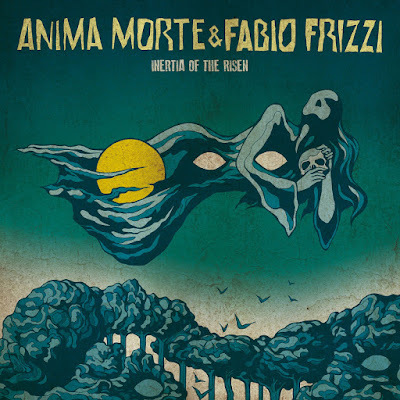 This EP consists of one song called 'Inertia Of the Risen' which was written and produced by Anima Morte and Fabio Frizzi. Originally they conceived to just have Fabio Frizzi guest star on the song but after many talks they managed to get him involved with actually helping them write the song as well. Being fans of the horror maestro's work since they were young, many members of the band was as you would expect, excited beyond belief that the man who they grew up listening to through all those zombie munching moments in Fulci films would work with them. The music is made using many of the instruments that you would expect to hear from that period to give the song that genuine sound, and they certainly pull it off. If you never heard of the band and played this in amongst a few Fabio Frizzi film soundtracks you would never have guessed its a new song. Beautifully layered throughout with sweeping guitar moments, drums with a consistent beat and keyboard moments that have you daydreaming that you were walking through the works of Lucio Fulci. With guest Julia Black providing her voice to the latter part of the song it really is like a song right out of THE BEYOND. The song may only last 4 minutes and 54 seconds long but it will stay with you the rest of the day, such is the strength of the music. Fans of progressive rock or horror soundtracks by artists such as Fabio Frizi, Goblin, Bruno Nicolai, Stelvio Cipriani, Ric Ortolani, Rick Wakeman, Ennio Morricone and many more, will get a real thrill out of listening to this. The EP is available in a digital download and also as a one sided collectors edition 7” EP with an engraving on the flipside and artwork by Costin Chioreanu. Included is also a postcard, a sticker and a digital download.